John Vaught is truly a legend at The University of Mississippi. 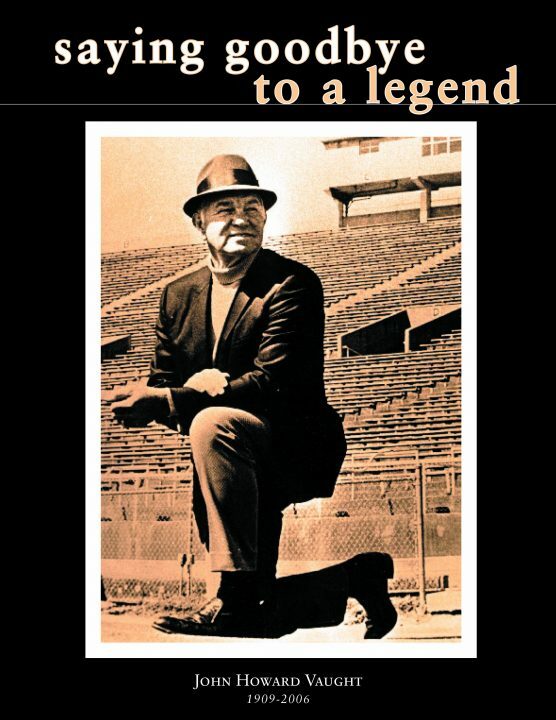 Many people say he is our version of Alabama’s Bear Bryant, but to us – he is our football king. Vaught coached the Rebels for 25 seasons and led them to three national championships (1959, 1960, and 1962). He still holds the record number of wins (190), along with appearing in 18 different bowl games (including eight Sugar Bowls) with a 10-8 record. He was not like a coach of the present. He did not wear a headset on the field and never got his suit dirty. The quarterback ran the plays as Vaught stood watching on the sidelines and would only call plays for field goals or punting, but only when needed. Before Vaught, there was Harold (Red) Drew of Bates in 1946. During Drew’s time, Vaught was a line coach. Once Drew resigned as head coach, Vaught took the reigns as a former All-American at TCU. Vaught ultimately changed the face of Ole Miss Rebel Football in many ways. Vaught’s 1959 team finished with a record of 10-1, only given up three touchdowns all year, to become the SEC Team of the Decade (1950-1959) and was ranked the third best collegiate football team from 1956 to 1995. While playing in Hemingway Stadium, later renamed Vaught-Hemingway Stadium in his honor, Vaught made this one of the toughest places in the nation for opposing teams to compete against the Rebels. From 1952-1964, Vaught’s Rebels had a 34-game home field streak, which included 21-straight victories from 1952-1959. During his first time as coach, the Rebels were ranked at the top of the Associated Press polls for three weeks during the 1960 season and one during the 1961 season. In 1964, the Rebels were ranked number one in the preseason with the Associated Press. During this time, the Rebels were among one of the most winningest programs in the country. 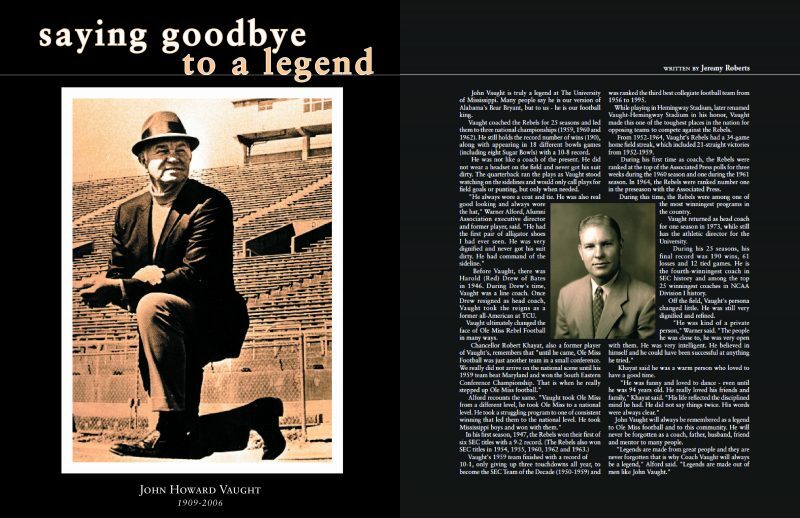 Vaught returned as head coach for one season in 1973, while still as athletic director for the University. During his 25 seasons, his final record was 190 wins, 61 losses and 12 tied games. He is the fourth-winningest coach in NCAA Division I history. Off the field, Vaught’s persona changed little. He was still very dignified and refined. Khayat said he was a warm person who loved to have a good time. John Vaught will always be remembered as a legend to Ole Miss football and to this community. He will never be forgotten as a coach, father, husband, friend and mentor to many people. Reprinted from The Ole Miss 2006, where Jeremy Roberts served as Editor-in-Chief for the 110th edition of The University of Mississippi’s yearbook. Coach John Howard Vaught passed on February 3, 2006, in Oxford, MS. Coleman Funeral Home was in charge of arrangements on February 9, 2006, at St. Peter’s Episcopal Church in Oxford, MS. This year, 2019, marks 13 years since Coach Vaught’s passing. This year, 2019, is also the 15th year anniversary of Coleman Funeral Home. 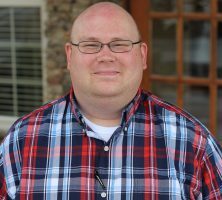 Coleman Funeral Home was honored to be a part of his service, forever grateful for his family entrusting his services and final wishes with our family.